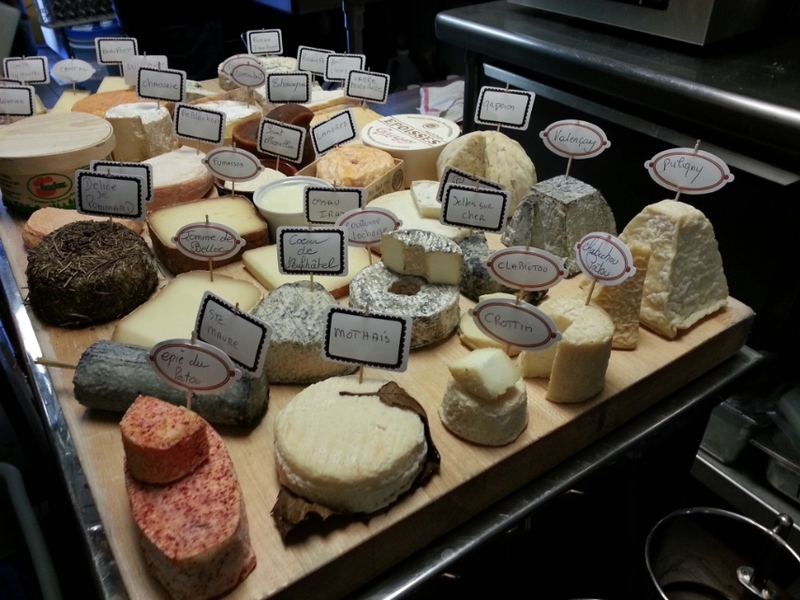 When it comes to his famous cheese cart, chef Laurent Quenioux doesn’t pull any false modesty. “We have the best cheese cart in the country,” he says, backing up the assertion with facts that are sure to excite those who get excited about such things—overall, the selection, which changes with the seasons and availability, showcases around 50 different varieties, 40 of which are raw milk cheeses from France and around ten that are produced by artisanal makers in the U.S.
Quenioux pops up, cheese cart in tow, all year ’round and all over the city as part of his LQ Fooding series. This weekend, his first “fooding” of the year will take place at Echo Park’s Taix, where he’ll be serving a six-course meal that includes scallops with Perigord black truffle and a foie parfait with artichokes two ways, quince, and gingerbread. The chef is particularly excited about hosting at the classic French restaurant, which he lauds for its lively ambiance and rich history. “It seems that old school is the new black,” he jokes. He’s also particularly excited about this weekend’s cheese service, which will include his personal favorites, Reblochon, an aged cow-milk cheese from the Alps, and Selles-sur-Cher, a tangy rind-encased goat cheese. “I’m crazy about goat cheese,” says Quenioux. “They are the king of cheeses to me.” However, he says that the absolute star of the cart will be the cow-milk Coulommier with fresh truffles, a rarity that’s ripened exclusively for Quenioux and only available in December and January. “If they’re not perfect, I finish ripening them myself,” he says. The Vacherin, a rich winter cheese, is another coup for L.A. cheese lovers as it’s only produced from around November to March. The cheese cart can be experienced along with the six-course meal (for an additional price) or a la carte, starting at 5pm. It will also be available in the bar area. LQ Foodings @ Taix Restaurant, 1911 Sunset Blvd., takes place Sunday, January 10 – Monday, January 11 with seatings starting from 5:30pm. Tickets ($59) for Sunday can be purchased here, Monday can be purchased here. Wine pairing is available; cheese cart is priced separately.